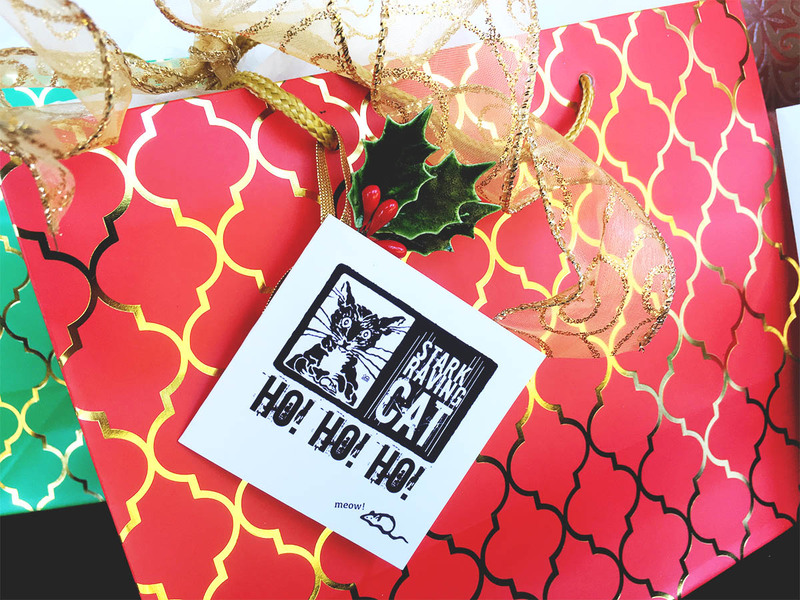 Festive gift bags with Stark Raving Cat’s purrsonal touch – complete with our own SRC gift tag, tissue, and fancy ribbon. 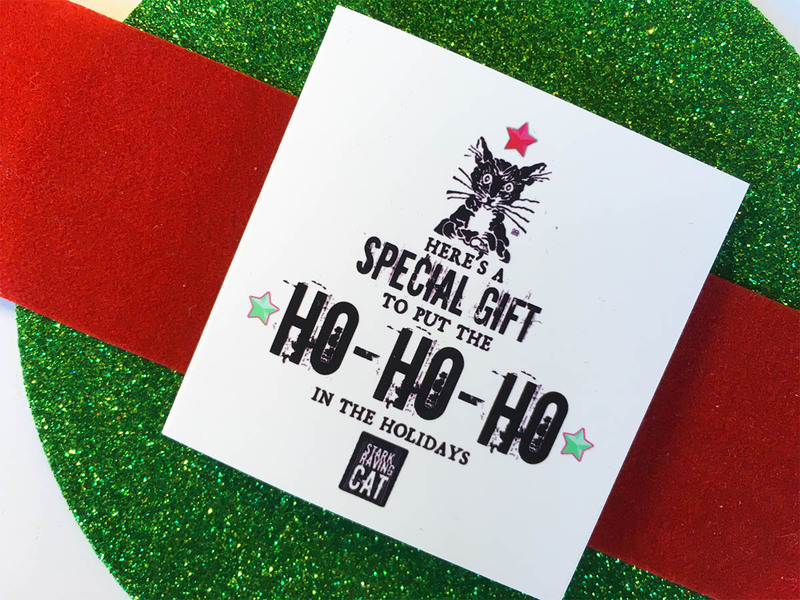 NOTE: We tailor out gift packaging to match the season. These are photos from Christmas, but in the rest of the year we use bright, happy colors that are not holiday oriented – like magenta, orange, lime green, and silver for instance. Easy Gifting: We pick the right size bag for your items – we’ll include a gift tag with your greeting, and ship directly to any address you provide. Easy, no-stress gift shopping! 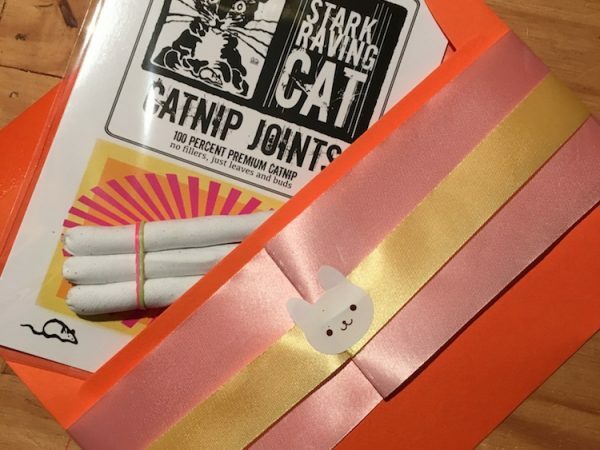 Photos show our assorted gift bags, and a Gift Envelope exclusively for Catnip Joint packs. 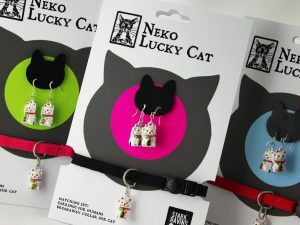 No need for you to select the size: Just pick the items you want, and we’ll pick the purrfect size bag. Depending on the gifts you select, our gift bag sizes can hold multiple items; about 6 items in most bags and about 10 items in our larger bags. Colors: Our bags come in a variety of colors, all with handles. Sending just a 3-pack or 5-pack of Catnip Joints? 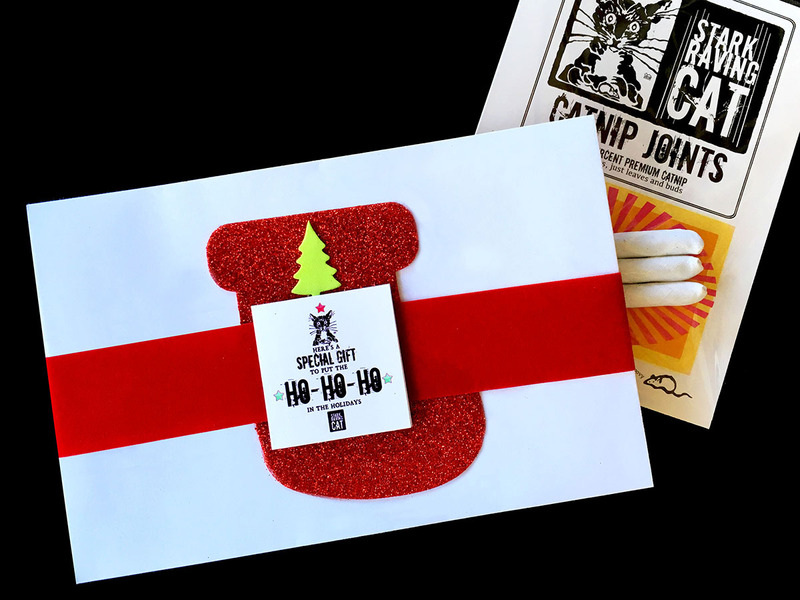 Our Gift Envelope is the ideal way to send our bestselling item by itself, sealed and ready to unwrap on Christmas or any other special occasion. 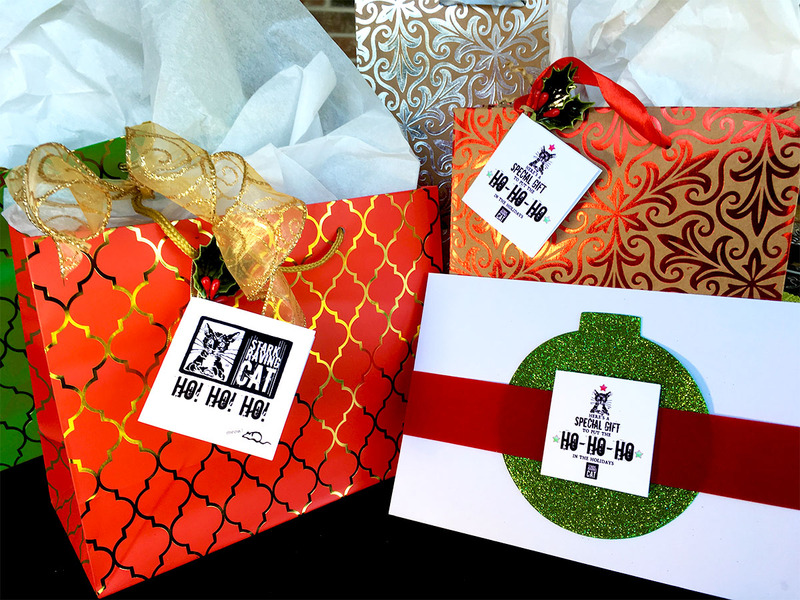 For Christmas the wrapping features a sparkly touch, red ribbon, and Ho-Ho-Ho gift tag with your personal message. Then we seal the package and ship it in a padded envelope. Easy peasy. 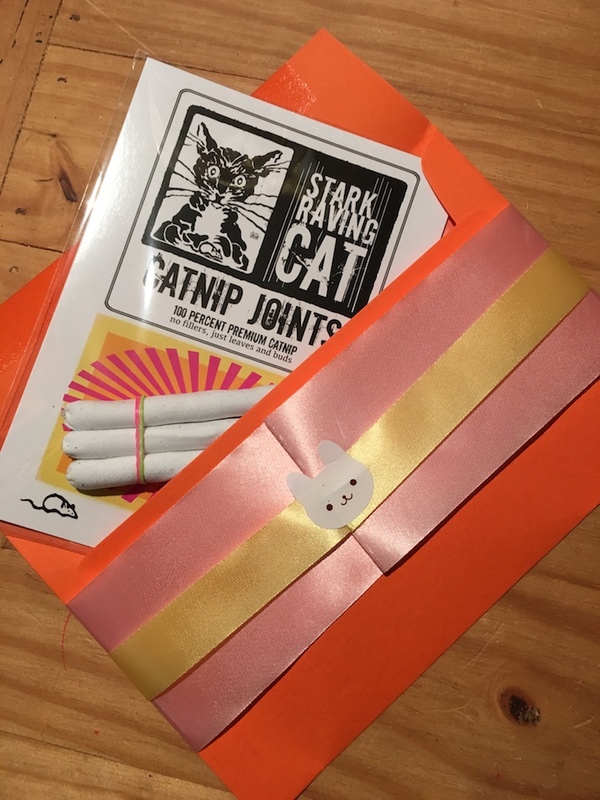 You can order the Catnip Joint Gift Envelope as a separate item here, or select it as an option directly on the Catnip Joint page when you order joints. 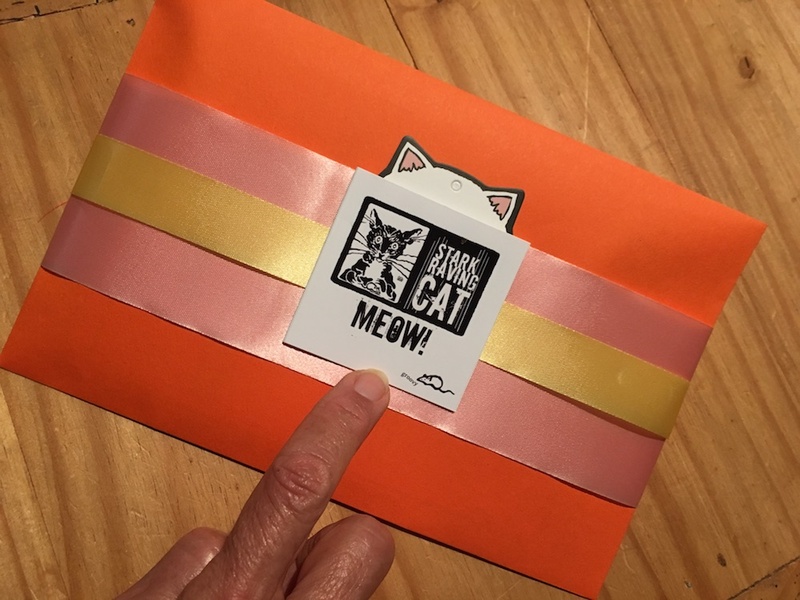 We also offer a “Flat Gift Bag Kit” – that is, the flat gift bag, sheets of tissue, wire ribbon, and gift card separately – so you can insert the gifts yourself. Handy for traveling and TSA inspections. 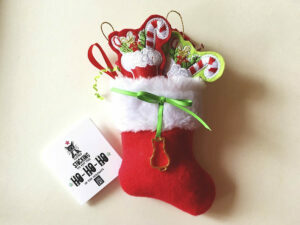 It’s the same price as our prepared gift bags. 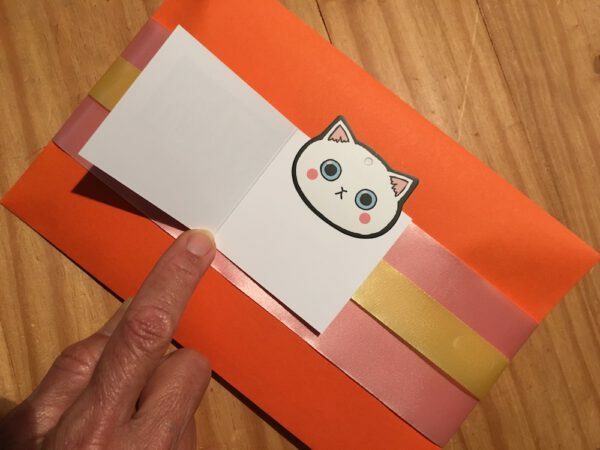 Gift Tag: Include your greeting in the Comments field when you order. We’ll pick the best size bag for your order. 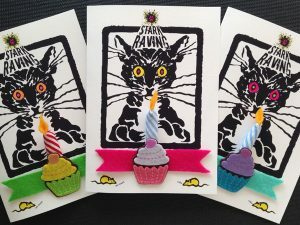 Sizes start at 5×8-inch and go up to 8×10-inch; most are 3 to 5 inches deep. 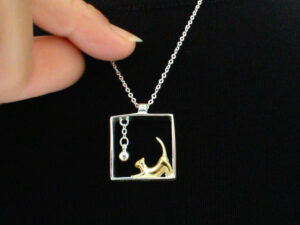 The most popular size is 7×9-inch or 9×7-inch (width-x-height). 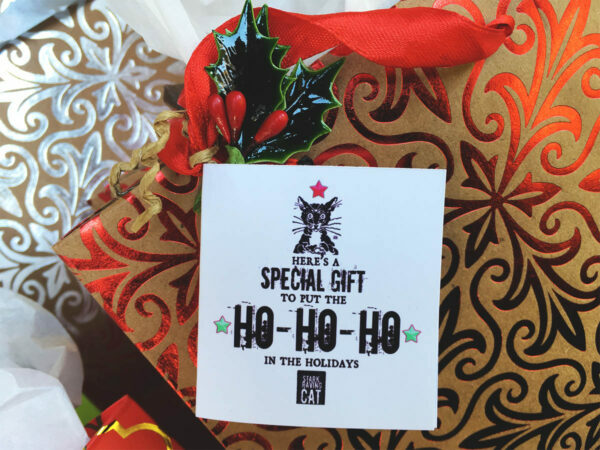 TSA may open and inspect gifts; our gift bags make this easy, and the wrapping won’t be wrecked. 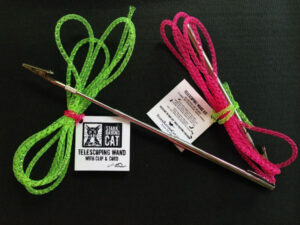 Plus, unlike regular ribbon, which wrinkles easily, our wired ribbons pop back into shape even if crushed (handy for packing in suitcases and shipping boxes.) 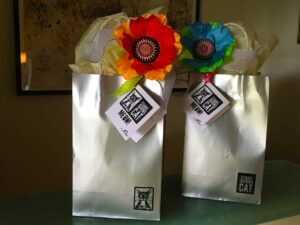 Or, select our “Flat Gift Bag” and pack the wrapping and gifts separately. Each cart order can only be shipped to a single address. 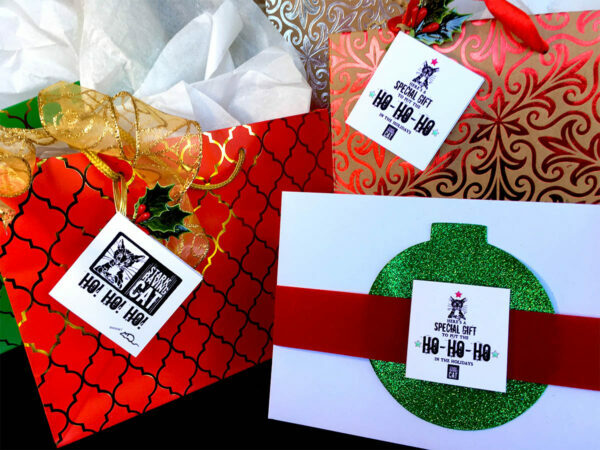 To send more than one gift bag, you’ll need to order each bag and its items separately. Make check-out faster: Save time – and typing – by registering your account in our shop. 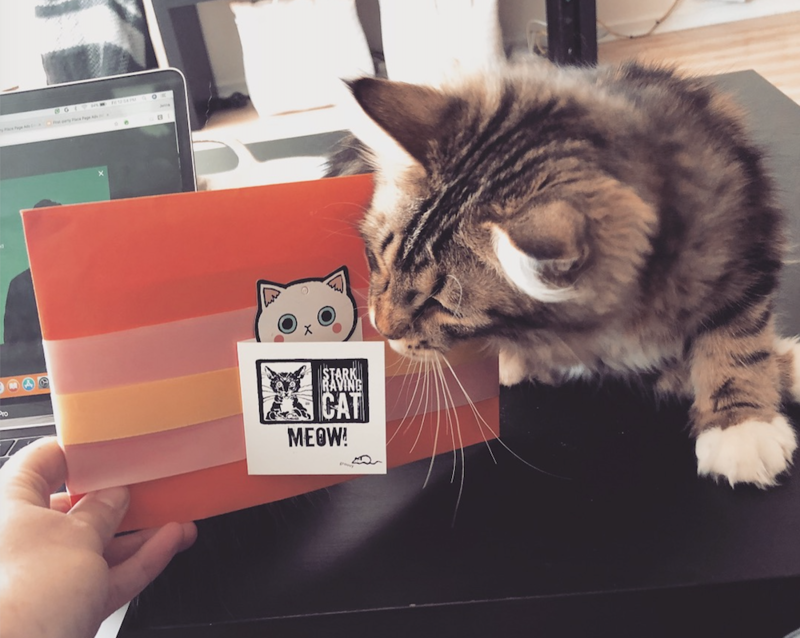 When you order, be sure to type in the correct shipping address for that order (if it’s not going to your home/default address). 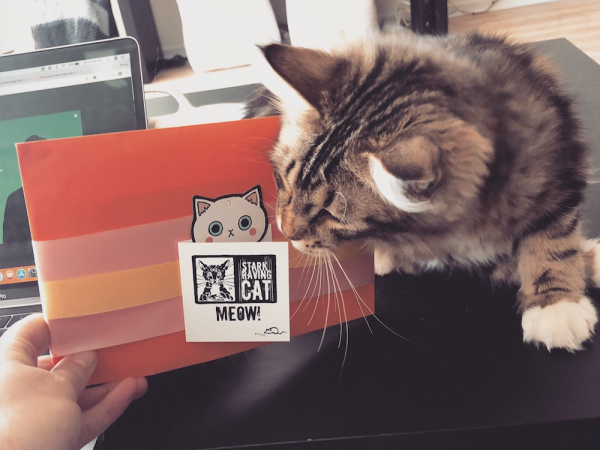 Check your shipping addresses – USPS may return items with incorrect addresses to us; if that happens, we can refund the item itself (if it’s in good condition), but we cannot refund the postage for incorrect addresses. NOTE: The gift wrap cannot be ordered by itself. Order one of our products, then return to the shop to add the appropriate gift wrap option for that product. 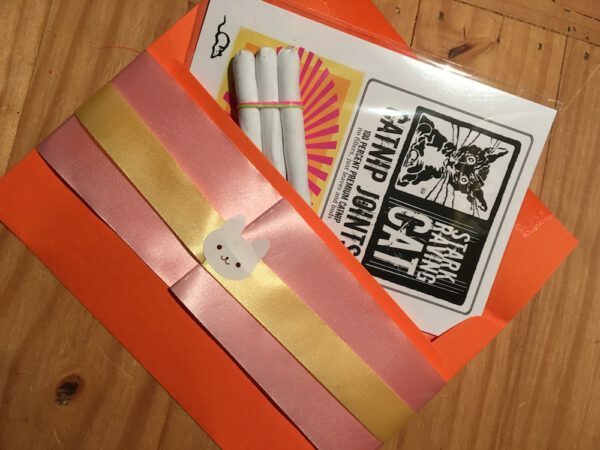 If you’re ordering Catnip Joints, you can also select the Gift Envelope on the Catnip Joint order page as an option.